Great Quote and Amazing Photo! Wow- i'm honestly in awe- this is a beautiful shot- and this is my favorite flower as is. Thanks for sharing am following you now, great blog. 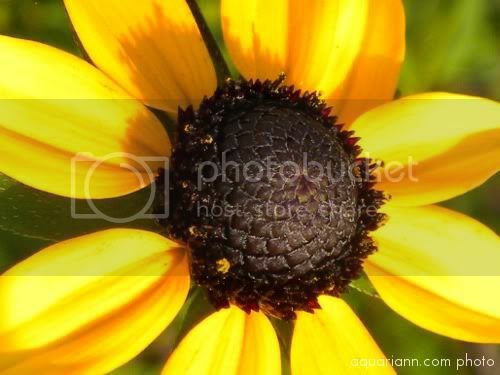 I love the black eyed susan macro! Some people call it a weed and I call them NUTS! Have a Happy Wordless Wednesday! Beautiful! I love Black Eyed Susans. I love sunflowers...so beautiful and colorful! Beautiful photo! I have a bunch of black eyed susans in my garden. Beautiful! I love the shapes formed in the center of the flower. It's really a beautiful shot! I love the color and the shape in the center of the flower. So colorful. Very pretty. They are not common in my area. Great close-up of the flower, especially with the cropping of the petals. I can see lots of the central detail. The quote was great and I love the picture. Appears to be a more dainty down to earth relative of the lofty sunflower. what a great shot, colors are so vivid! thx for linking up today! The black eyed susan is one of my favorites! Beautiful! I love how you can see the intricacies in the middle. Very pretty, I love the black eyed susans! Super gorgeous..I love the closeup shot...magical indeed! I have lots of BES in my garden...and love them! Happy WW..I really must play soon! Beautiful!! The details are awesome.